I think I have now discovered Howard’s blood brother – Brickplumber – thanks to a random link I happened across on the interweb. While you have to worry about this guy’s social life (unless the Lego people are his friends. Then again I just checked his Flickr profile and it says he is taken) what a fantastic thing he has made. The attention to detail, the sheer scale, the craftsmanship – and all using Lego. If you look at the photostream (link below) you can even see little Lego footprints in the Lego snow. 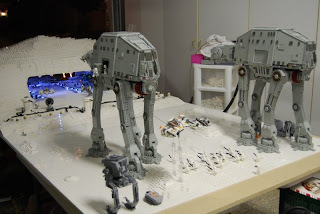 I think my awe is magnified by the fact that he took FOUR YEARS to build it, whereas when I was a kid I had no patience for Lego, and would inevitably end up throwing whatever I was building across the room in frustration after 10 minutes. Brickplumber – I salute you, you are a true genius. And Mrs Brickplumber, I salute you too, for having the patience and understanding to allow your partner to indulge in an obsession which makes the world a little bit better for the rest of us. Check out his Flickr photostream.